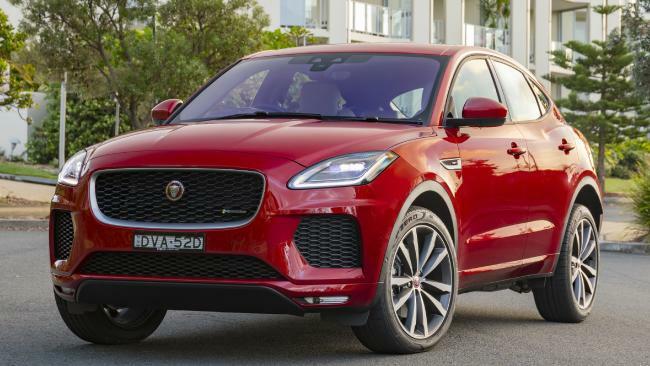 The Jaguar E-Pace will take on the heavyweights in the baby luxury SUV class. Pic: Supplied. THERE'S a lot riding on Jaguar's new E-Pace. Sure to be the Brit brand's bestseller in its ever-expanding model range, the baby SUV lands in an ultra-competitive segment that includes all the luxury heavyweights. 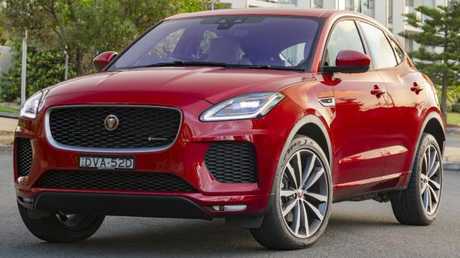 Jaguar Australia's group product and planning manager Andrew Chapman says the E-Pace will stand out as "the coolest SUV in the hottest segment," with a vast selection of grades and prices to offer "ultimate customer choice". He's not wrong. 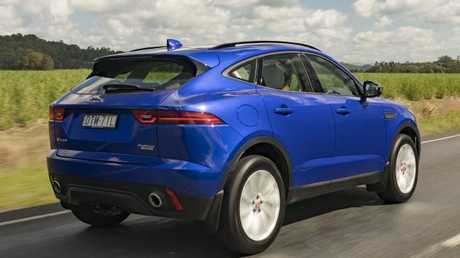 The E-Pace range is dizzyingly vast with five different 2.0-litre turbo four-cylinder engines (three diesels and two petrols), four different trims (normal, S, SE and HSE) and the opportunity to add sportier R-Dynamic packs to any of the above. The E-Pace will be the cheapest Jaguar on sale. Pic: Supplied. Throw in E-Pace First Edition models for early adopters, plus an options list of frightening proportions and the head-scratching hits overdrive. 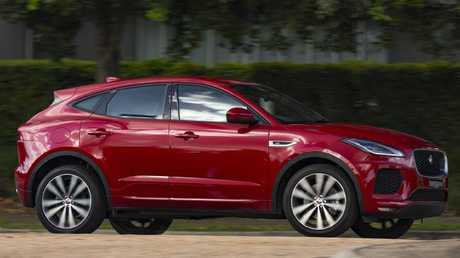 On the positive side, it means there's an E-Pace for nearly everyone. The unquestionably beautiful looking Jaguar is available from as little as $47,750 before on-roads, although the entry-level car lacks many of the goodies expected of a premium brand. At the top end, the P250 First Edition starts from $84,370, although some of the media launch cars were nudging $100,000 once options were added. The E-Pace is unquestionably a great looking vehicle. Pic: Supplied. Jaguar says it needs to compete aggressively in the $50-70k bracket, and believes most customers will choose a diesel engine with the more generous S or SE trim. We spent most time in the E-Pace D240 SE, which starts at $68,850. This range-topping diesel is good for a lusty 177kW of power and 500Nm of torque. It hits 100km/h in 7.4 seconds while returning 6.2L/100km. Impressively, we nearly matched this economy during our varied road test. As with all E-Paces the D240 has a nine-speed automatic gearbox and all-wheel-drive, while it also has 19-inch wheels, electric grained leather seats, power tailgate, navigation and a decent suite of active safety systems. The cabin looks classy but some items are missing from the standard equipment list. Pic: Supplied. But there are some key omissions. No E-Pace has Apple CarPlay/Android Auto, there's no keyless entry or digital dash and you only get paddle shifters with an R-Dynamic pack (about $5000 depending on trim). The entry level D150 has 17-inch wheels, cloth seats and no sat nav but does score a 10-inch touchscreen, solid safety kit and two-zone climate control. It's not sumptuous inside, but the dash layout is classy, with an elegant centre console housing the wide-screen display. 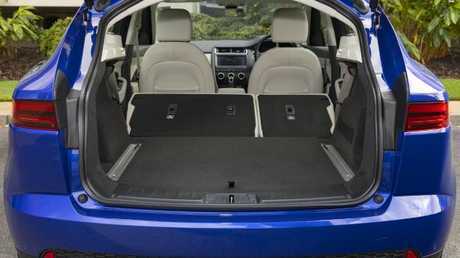 It also has quality grained leather seats. Despite the E-Pace's coupe-esque roofline the rear seats have brilliant headroom, although leg space is a tad cramped. The boot is a decent size for the class. Pic: Supplied. The boot too, at 484 litres, is of decent size for the class, although with rear seats folded it doesn't have the room of many key rivals. 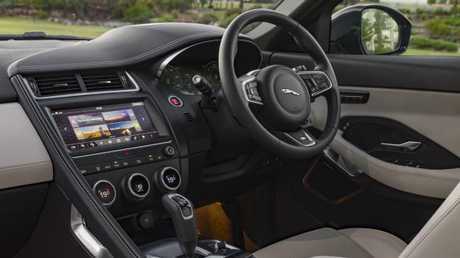 There are a few cheaper-feeling dash elements - the gear shifter surround the biggest culprit - but overall the E-Pace oozes style, especially if you option a brighter, daring cabin colour. First thing to note is that the E-Pace is a true fat cat. It's built on an all-new platform but the D240 weighs over 1900kg, meaning you have two-tonnes to punt along with driver on board. Jag's larger F-Pace SUV is more than 100kg lighter thanks to its largely aluminium structure; the E-Pace has gone the cheaper steel route. The fact the E-Pace drives so well despite its bulk, particularly when hustled around corners, is a credit to the engineers. The E-Pace drives well despite its bulk. Picture: Supplied. This is partly down to the D240's Active Driveline AWD system, which rewards enthusiastic cornering and feels nicely balanced if you're smooth with directional changes. The diesel engine has some zest when pushed and works in harmony with the impressive auto gearbox. Lesser E-Paces feature a more basic AWD system, but all variants I tested felt exactly as core buyers should expect: solid, safe and with a dash of playfulness thrown in. Those on larger 19- or 20-inch wheels suffer more cabin tyre noise and you feel the road bumps more acutely, but for town and highway use it's a refined and well-insulated drive. It is still a Jag, after all. The E-Pace is one of the best looking small SUVs on the market and looks great value at its entry price, but expect to pay a lot more for the one you really want.